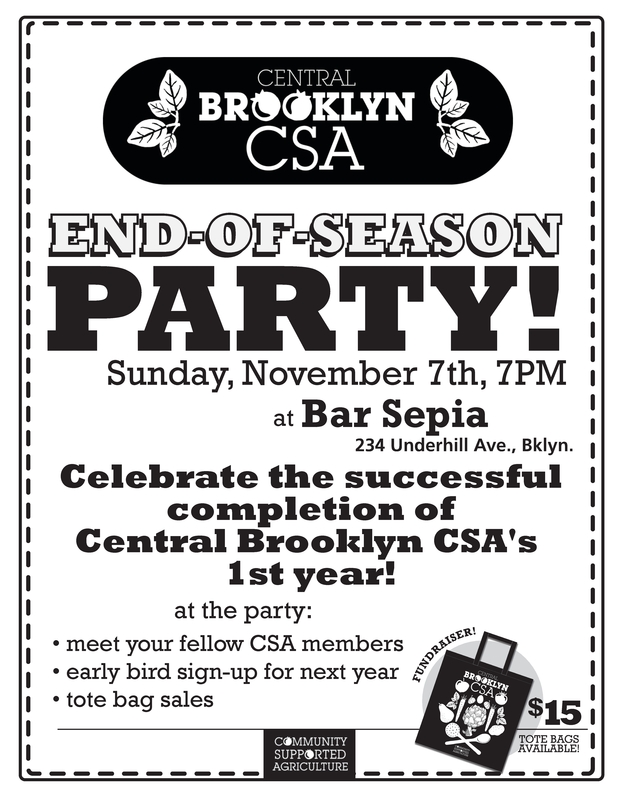 The Best Central Brooklyn (Bed Stuy, Crown Heights, and surrounding areas) CSA End of Season Party of All Time! If you are reading this blog post, we can assume two things about you: 1) you love great-tasting, sustainable produce; and 2) you love to party. As your luck would have it, both of those things come together at 7pm, Sunday November 7th! It’s true, the Central Brooklyn CSA (serving Bed Stuy, Crown Heights, and surrounding areas) is having its first End of Season Party (or as we like to call it,” the Blowout Bash, the Premier Part-tay Around the Way, the Mega Mixer, the Super Soiree, the Best Fest, Get Your Groove On Dot Com”) at Bar Sepia. Join us. Shake your groove thang.